Questions that don’t get asked, don’t get answered. One of my greatest regrets was not having spent the time with Mom and Dad exploring their life experiences. My siblings and I were very fortunate that Mom and Dad anticipated us eventually having questions about their life experiences. They wrote a brief memoir. However, because I was too caught up in my own life to even realize that there was a heck of a lot more to Mom and Dad than that of a child’s perspective – I was left with a lot of unanswered (albeit unasked) questions. 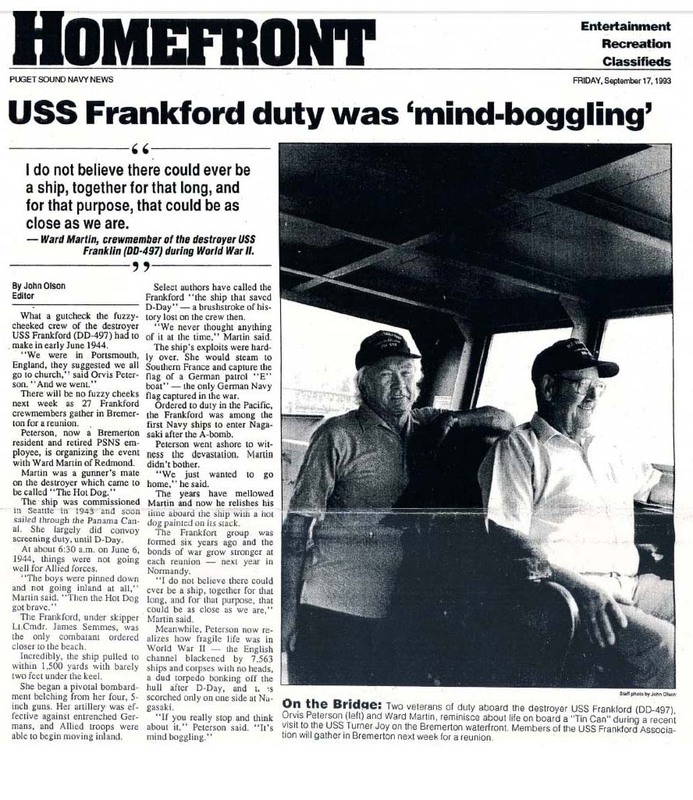 Case in point; Dad served on the USS Frankford during WWII. This I knew. What I didn’t find out until after his death while going through his personal effects and conducting some simple online research – was a story about his ship. On D-Day during the Normandy invasion, Dad was in the forward gun turret and like the other sailors focused on their jobs which was surely a very stressful day at work. He was unaware of the bigger picture of the role that his ship played on that day. Dad probably never realized the impact his ship had for the lives of many GI’s. While it was regretful that Dad did not know the full story of that day, that wasn’t the worst of it. My research revealed that there had been reunions of his shipmates, some of which even met onboard the ship before it was mothballed. While Dad was not the most social guy, he would have loved to have revisited the ship, reconnected with some of his buddies and shown his family the ship he was on during the war. Had I had more interest and time I would have been able to help connect Dad to his past and add some quality to both his life and mine as we shared his memories together. Plus, I’m sure we all would have had many more stories and more insights into that time of his life. While this ship story is unique to Dad and his shipmates, your Dad, your mother,, your grandfathers and grandmothers all have stories as well. Are you doing everything you can to not have to learn this lesson of regret? It is never too early to start. OurStoriesAreUs.com was designed to help you do it, one short story at a time. Sign up now and help your parents and grandparents share their first story. Note: While the default setting for OurStoriesAreUS.com is set to private (so as to keep stories only in the family view), we will provide the option for you to make select stories public. Some stories just need to be shared. If you are interested in hearing this story of Dad’s ship, follow us on Twitter, Instagram or Facebook to be notified as to when we make this story available to public viewing.